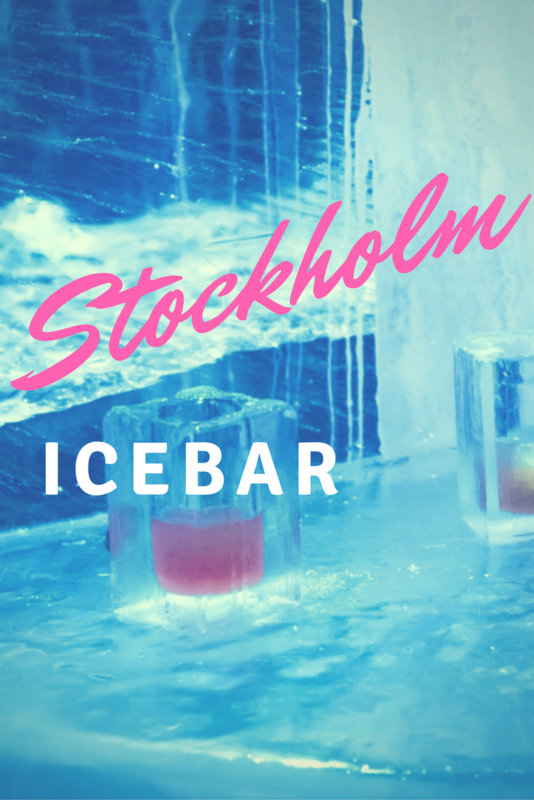 What is Stockholm’s ICEBAR like? Well, as you’d expect, it’s like walking into a giant freezer. A freezer with a bar, that is. A freezer full of animals elaborately carved into huge blocks of glistening ice. A freezer where people wander around in foil capes. So, not really like a freezer at all. Except that it’s cold, which is really where that simile was going. Having lived in Sweden for three winters I am familiar with just how cold Stockholm gets, so in comparison with -28°c February days ICEBAR’s regulated -5°c is actually pretty mild. However, on a warm July evening when you have no coat and open shoes it sure feels a helluva lot colder. Thank goodness for those arctic robes you’re given when you arrive! Visiting ICEBAR was the first thing I did when I came to Stockholm to attend TBEX this summer. A few days earlier, I responded to a Facebook post suggesting a group visit, which a few people had signed up to. Since this year’s conference was my first ever TBEX, I was nervous at the prospect of meeting so many of my travel blogging peers – many of whom I have admired since their early days, and I thought it would be good to meet a few people before the event. Feeling a little lost, I loitered near the entrance for a few moments. “Are you with TBEX?” a voice said behind me. I turned to see a friendly-featured fellow smiling at me. “Yes. It’s my first one, I’m really nervous”, I blurted. Damn, not the cool and collected entrance I was hoping for. Before long, more people had gathered and we were handed the signature blue capes with the (faux) fur-lined hoods and gloves. Finally, we were ushered inside; a bunch of excited bloggers with the place almost to ourselves. 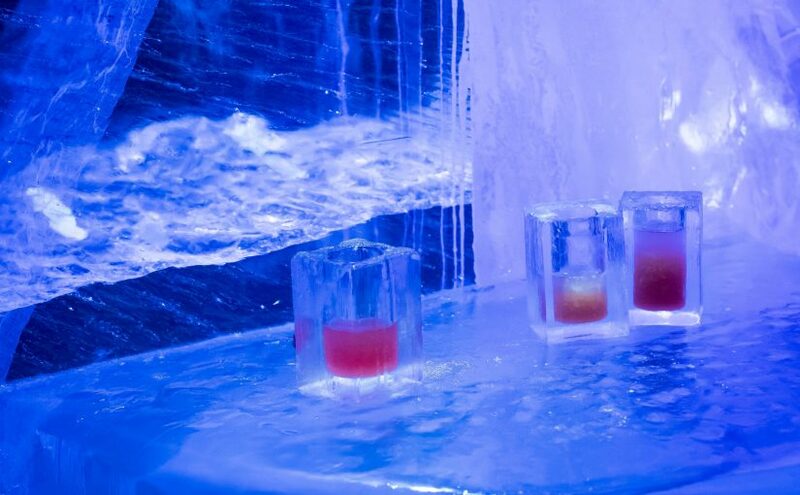 It’s a cliché to say it, but ICEBAR really is a winter wonderland – it’s designed to be magical. 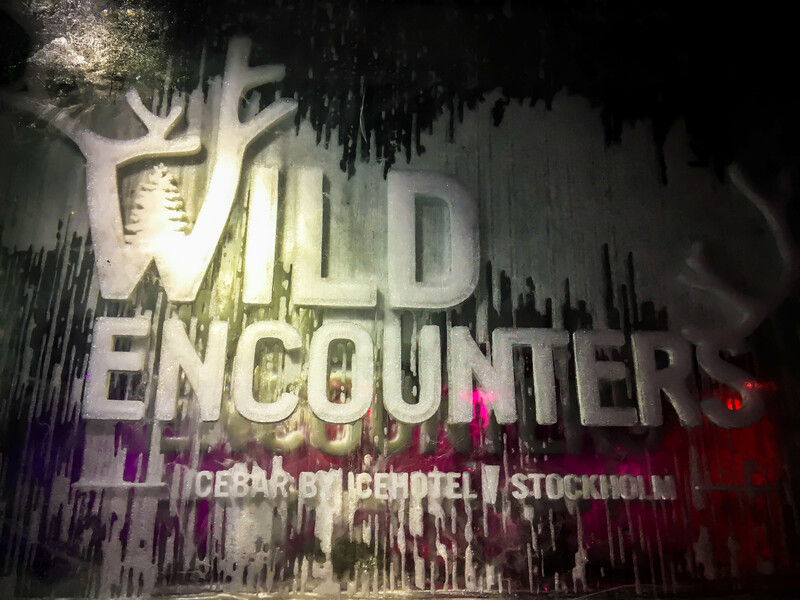 This year’s theme is ‘Wild Encounters’, so the ice is carved with all sorts of elaborate Scandinavian animal carvings. A bear towers in one corner, whilst a deer peeps out cautiously from behind a crystal wall. Neon lights scatter colour in every direction as it bounces off the ice. It truly is spectacular. 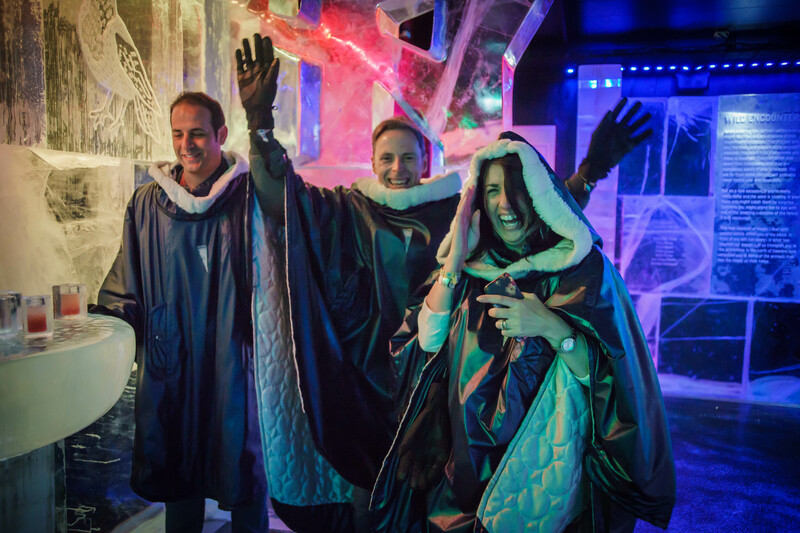 When you book to visit ICEBAR (you should book ahead as it is really popular), you are allocated a 40-minute slot. 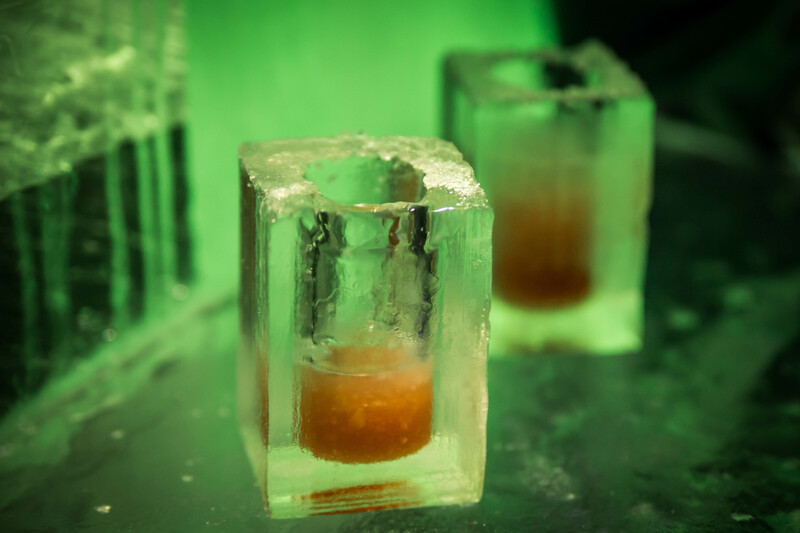 With your ticket you receive a complimentary shot poured into a shot-glass made entirely of ice. All the shots are named after animals, I had the ‘Gray Wolf’, which was vodka mixed with lingonberry and lime. The thick gloves make it possible to hold your drink, but if you keep taking your gloves off to take pictures, as I did, your hands will feel the cold very quickly. It’s easy enough to keep warm though, as you are too busy moving around the bar to see all the decorations before it’s time to leave. The only problem I had was trying to find somewhere to put down my drink, as the flat surfaces had become so worn and smooth that the glass started to slide off! Have you visited an Ice Bar on your travels, if so, where? If you enjoyed the post please share it on your social media channels. I really like cool places like that! Especially in Stockholm I think it’s a must go. I also think it’s a reasonable price for the Swedish capital! I’m actually surprised it’s as reasonably priced as it is! Yes! I went to an Ice Bar in Auckland. It’s definitely not an experience for me but it was fun at the moment. Your drinks look great. Sounds so fun! I’ve heard of the NZ one, but I didn’t know Stockholm had an Icebar too! I’d go just to be able to wear those capes, if I’m being honest haha. The capes are amazing! I have just bought something similar to wear in the house over the winter – it’s fluffy with a big furry hood! This would be so “cool” so to speak, I have never been to one of these and did not know they operate year round. In Canada, they have a ice hotel I have wanted to visit but it melts and has to be rebuilt every year. We have never attended a TBEX convention. We are leaving for the Manila meeting in October in a few days. I hope they are worthwhile. They re-sculpt the Stockholm Ice bar decorations every year, so I’m not sure how they do that! I imagine the interior stays mainly the same and they bring in the new exhibits. I really enjoyed TBEX this year, I got a lot out of it and I met some really great people. I was slowing down on my blogging before I went, but I’ve been really inspired ever since. Enjoy Manila! There was an Ice Bar in Amsterdam that I missed, but I am going to Stockholm this winter for a short trip, so I would love to finally check it out. Drinking your shot from the ice cup, was it refreshing? I’m also going to go to TBEX North America 2017, hope to see you there! I am so jealous of you going to Stockholm, it really is one of my favourite cities in the world. I would say the ice cup is cold, rather than refreshing. The drink was good though! I can imagine that the kids were pretty excited to be there too!! I would definitely go for a later night visit next time – there were no kids when I went! haha perfect headline – I love Frozen! I once made it my life goal to go to all the ice bars in the world .. as there are not that many. I do still fancy them myself – and I haven’t been to this one yet. On the list it goes. I love Frozen too 😀 Apparently, there is one here in Bratislava, but it wasn’t open when I tried to go a few weeks back. Which ones have you been to? So growing up in Texas, I am not used to the cold and have a hard time with NYC winters! I still would like to take a few pictures and try one of the shots in the ice glass! Does NYC have an ice bar? I imagine it must do somewhere. They give you thermal capes and thick gloves, so it’s not as cold as you might think. Perhaps it’s even warmer in the bar than outside in the winter?!! I just came back from Barcelona and my brother’s wife recommended me visiting an Ice bar there. Sadly, I did not have the time. I really need to sign up for the next TBEX event and what an amazing idea to have it there! €22 sounds quite cheap for a place likes this and for Stockholm which is an expensive city. I’d love to try it! What a fantastic spot! 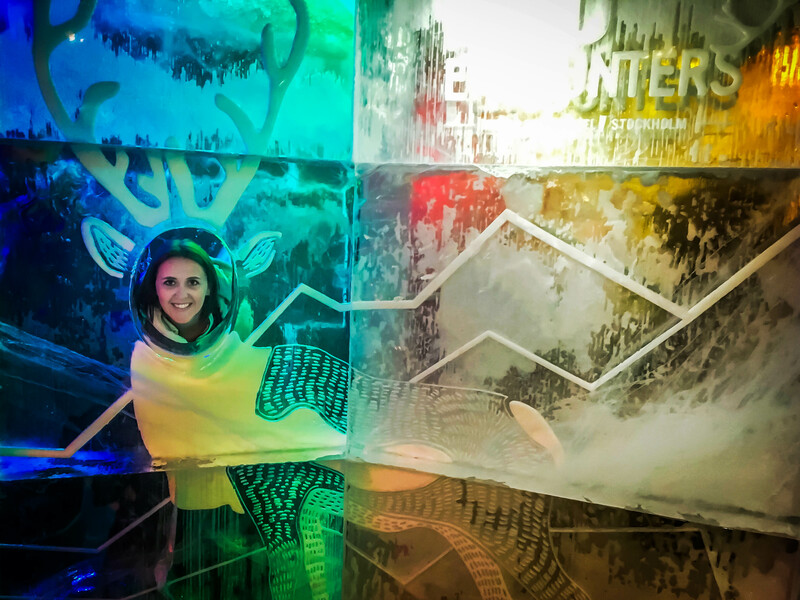 I’ve been in an ice bar before but it certainly wasn’t memorable like this one… we’re off to Sweden in December and I think we may just have to swing by here! Which ice bar did you go to and why was it so bad? A great deal of time and effort has gone into sculpting the one in Stockholm. I shiver just thinking about hanging out in an icy bar! But seriously though, that sounds like such a unique, fun experience and I’d love to try it someday. Can you only stay for 40 minutes though? Believe me, 40 minutes is plenty long enough. It’s very cold in there!! I have not yet been to the ICE Hotel yet either, I would very much like to go. If it is anything like the ICE Bar, it will be amazing!